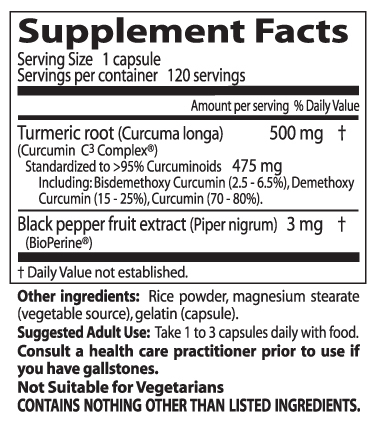 Best Curcumin C3 Complex® with Bioperine® tablets and capsules contain a potent standardized extract of Curcuma longa root. Commonly known as turmeric, Curcuma longa has many culinary uses and is widely known as a spice imparting both color and flavor to curried dishes. It has likewise been appreciated for centuries in the Ayurvedic healing tradition. The known active components in Curcuma longa are a group of compounds collectively called curcuminoids, a class of analogues that have demonstrated potent antioxidant properties and a wide spectrum of complex molecular actions that have been uncovered through extensive research. Although the term curcumin is routinely used as a name for curcuminoids, pure curcumin is just one of the naturally occurring curcuminoids. Curcumin C3 Complex® (95% total curcuminoids) supplies the 3 prominent curcuminoids from turmeric: pure curcumin (diferuloyl methane), bisdemethoxy curcumin (BDMC), and demethoxy curcumin (DMC). BioPerine®, an extract of black pepper fruit that contains 95-98% piperine, is added as a natural bioenhancer to promote absorption of the product. Due to the potent radical-scavenging activity of curcuminoids, human skin cells oxidized in vitro by the superoxide radical-generating toxin nitroblue tetrazolium fared better when curcumin or a mixture of the 3 curcuminoids was administered. Furthermore, the 3 curcuminoids had a greater effect than an equal amount of curcumin alone, suggesting synergistic action.4 Another study using skin cells found that curcuminoids supported antioxidant enzyme activity and cellular antioxidant defense capacity under exposure to Ultraviolet A (UVA) irradiation. 5 This matters to us because UVA radiation from sunlight can accelerate skin aging. Between these in vitro studies, results suggest that curcumin may help to promote a more graceful aging of the skinand that a combination formula of all 3 curcuminoids may be even better. A plethora of animal studies have illustrated the ability of curcumin to modulate cell behavior and answer to physiological insults such as toxins. Curcumin enhanced stability of the glyoxalase system put under stress in mice, leading the authors to conclude that curcumin may be able to afford humans the same type of advantage against background radiation.6 In other studies, curcumin stimulated enhanced liver function in rats exposed to carbon tetrachloride (CCl4), a potent toxin.7 Another group of researchers who exposed mice to ferric nitrilotriacetate (Fe-NTA) found that curcumin enhanced kidney function to favor a better outcome.8 These researchers note that on top of its antioxidant activity, curcumin appears to enhance activities of enzymes that promote normal detoxification of everyday toxins. It is believed that curcumin may help induce phase II enzyme activitya very important step in the detoxification process. Additional studies have shown that curcumin administered to rats following the administration of pro-oxidant chemicals altered serum levels of alanine aminotransferase (ALT) and thiobarbituric acid reactive substances (TBARS), which are major indicators of lipid peroxidation and oxidative stress.9 These results further suggest that curcumin may enhance the detoxifying ability of the liver. A recent study in rats looking at the effect of turmeric extract versus the toxin doxorubicin (DOX) led the scientists to conclude that turmeric extract provided antioxidant defense for multiple organs, including the heart, liver, and kidneys.10 Together, all of these in vivo results strongly suggest that curcumin is a potent defender with a potentially wide range of applications. A 2005 study has investigated the ability and potential of curcuminoids to support healthy brain aging and maintenance of cognitive function. A large number of both in vitro and in vivo (animal) studies confirm the ability of curcumin to enhance neuron integrity, chiefly through the free radical scavenging abilities of this compound. When animals were administered compounds with known brain toxicity, subsequent administration of curcumin led to a significantly more balanced neurological outcome when compared to control animals.15 Oral administration of curcumin in rats exposed to a neurotoxin that humans are commonly exposed to promoted lipid integrity, reduced levels of free radical metabolites, and increased levels of glutathione, a major physiologic antioxidant.16 Curcumin is thought to produce these antioxidant effects in brain tissue due to its ability to readily cross the blood-brain barrier. Further studies suggest that curcumin is one of the few compounds that are actually likely to support youthful brain aging. Tetrahydrocurcumin, a major metabolite of curcumin, has been shown to contribute to the life span of middle-aged mice. Additional animal research has shown that long-term administration of curcumin supported brain lipid integrity and favorably altered the brain-aging marker known as lipofuscin. Curcumin has also been shown to increase the activity of numerous enzymes that support antioxidant defenses.17 Curcumin pretreatment of rat PC12 (neuronal) cells in vitro recently helped scientists to determine some proposed mechanisms of action. They concluded that low-dose curcumin helped maintain cell healthand the integrity of DNA within themthrough inhibition of oxidative stress, calcium influx, and hyperphosphorylation.18 These findings display the ability of curcumin and its metabolites to promote healthy brain aging mainly by fighting age-related oxidative stress. In 2009 a fascinating neuronal study cropped up, this time examining effects of the curcumin/piperine combination on behaviors elicited through chronic stress.19 In it, rats were subjected to stress that led to behavior different than that of rats not subjected to stress. Curcumin significantly alleviated stress in the rats, as measured through both behavioral and biochemical testing. Furthermore, the combination of curcumin with piperine was more potent than curcumin alone. Ammon, H.P. and M.A. Wahl, Pharmacology of Curcuma longa. Planta Med, 1991. 57(1):p. 1-7. Mahattanadul, S., et al., Comparative antiulcer effect of bisdemethoxycurcumin and curcumin in a gastric ulcer model system. Phytomedicine, 2009. 16(4): p. 342-51. Anand, P., et al., Biological activities of curcumin and its analogues (Congeners) made by man and Mother Nature. Biochem Pharmacol, 2008. 76(11): p. 1590-611. Bonte, F., et al., Protective effect of curcuminoids on epidermal skin cells under free oxygen radical stress. Planta Med, 1997. 63(3): p. 265-6. Panich, U., et al., Modulation of antioxidant defense by Alpinia galanga and Curcuma aromatica extracts correlates with their inhibition of UVA-induced melanogenesis. Cell Biol Toxicol, 2010. 26(2): p. 103-16. Choudhary, D., D. Chandra, and R.K. Kale, Modulation of radioresponse of glyoxalase system by curcumin. J Ethnopharmacol, 1999. 64(1): p. 1-7. Park, E.J., et al., Protective effect of curcumin in rat liver injury induced by carbon tetrachloride. J Pharm Pharmacol, 2000. 52(4): p. 437-40. Iqbal, M., Y. Okazaki, and S. Okada, Curcumin attenuates oxidative damage in animals treated with a renal carcinogen, ferric nitrilotriacetate (Fe-NTA): implications for cancer prevention. Mol Cell Biochem, 2009. 324(1-2): p. 157-64. Krishnaswamy, K., Traditional Indian spices and their health significance. Asia Pac J Clin Nutr, 2008. 17 Suppl 1: p. 265-8. Mohamad, R.H., et al., The role of Curcuma longa against doxorubicin (adriamycin)- induced toxicity in rats. J Med Food, 2009. 12(2): p. 394-402. Ramirez-Bosca, A., et al., Antioxidant Curcuma extracts decrease the blood lipid peroxide levels of human subjects. Age, 1995. 18: p. 167-169. Funk, J.L., et al., Turmeric extracts containing curcuminoids prevent experimental rheumatoid arthritis. Journal of Natural Products, 2006. 69(3): p. 351-355. Funk, J.L., et al., Efficacy and mechanism of action of turmeric supplements in the treatment of experimental arthritis. Arthritis Rheum, 2006. 54(11): p. 3452-64. Khanna, D., et al., Natural products as a gold mine for arthritis treatment. Curr Opin Pharmacol, 2007. 7(3): p. 344-51. Ringman, J.M., et al., A potential role of the curry spice curcumin in Alzheimer's disease. Curr Alzheimer Res, 2005. 2(2): p. 131-6. Rajakrishnan, V., et al., Neuroprotective role of curcumin from curcuma longa on ethanol-induced brain damage. Phytother Res, 1999. 13(7): p. 571-4. Cole, G.M., B. Teter, and S.A. Frautschy, Neuroprotective effects of curcumin. Adv Exp Med Biol, 2007. 595: p. 197-212. Park, S.Y., et al., Curcumin protected PC12 cells against beta-amyloid-induced toxicity through the inhibition of oxidative damage and tau hyperphosphorylation. Food Chem Toxicol, 2008. 46(8): p. 2881-7. Bhutani, M.K., M. Bishnoi, and S.K. Kulkarni, Anti-depressant like effect of curcumin and its combination with piperine in unpredictable chronic stress-induced behavioral, biochemical and neurochemical changes. Pharmacol Biochem Behav, 2009. 92(1): p. 39-43. Atal, C.K., U. Zutshi, and P.G. Rao, Scientific evidence on the role of Ayurvedic herbals on bioavailability of drugs. J Ethnopharmacol, 1981. 4(2): p. 229-32.